On Saturday 23rd July 2011, at Manchester Mela, Platt Fields Park in Fallowfield, a Bollywood Guinness World Record, sponsored by Rubicon, was broken for the most people dancing to a Bollywood routine at the same time. This Bollywood dance routine was choreographed by Ria Meera Munshi, Director of Ri Ri’s Dance Academy. The Manchester crowd of 1,406 non dancers were given a Bollywood dance master class by Ria, who taught the routine live with four of Ri Ri’s talented male and female dancers, also, on stage. The choreography was specially created to be simple and fun allowing participants of all ages, from all walks of life, to partake in this incredible moment of history. 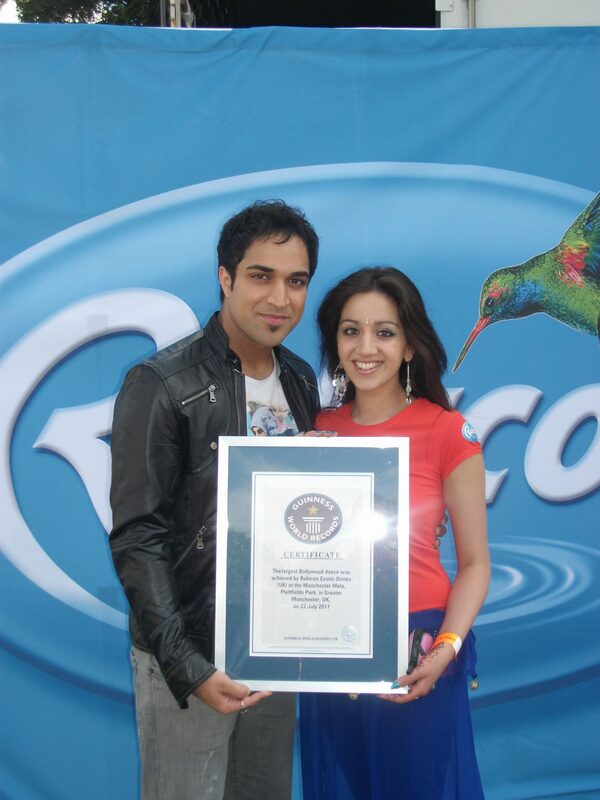 ‘Mehbooba’ sang by British Asian musician, Navin Kundra, was the song the Guinness World Record was broken too. For each person dancing, Rubicon donated £5 to the British Asian Trust. Ri Ri’s Guinness World Record Breaking project took them to the front page of the Ashton Reporter (Now the Tameside Reporter) as well as having a large feature in Asian Lite, in August 2011. BBC Radio Manchester then invited Ria for an interview, speaking with Talat Farooq Awan, about the Academy,Guinness World Record and future plans for the Company.